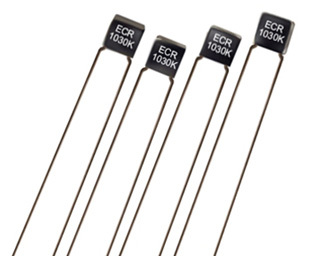 ECR Series | Film Capacitors - Electronic Concepts Inc.
Avionicap® Sub-Miniature Metallized Polycarbonate Capacitors. Replacement for CK05 ceramics with improved electrical properties. The ECR Series is ideal for Medical Devices and Instrumentation, Computers, Signal Processing Equipment and Precision Testing/Measure. A new innovation pioneered by Electronic Concepts which leads the way to a new era of smaller metalized film capacitors. Now a combination of excellent electrical characteristics and compactness is offered the equipment designer in a size comparable to a ceramic CK05 capacitor. Besides the superior electrical characteristics these capacitors are self-healing, as is the case with all metalized film capacitors. Additionally, these capacitors do not exhibit any of the drawbacks inherent in ceramic capacitors. Premolded epoxy case, epoxy encapsulated. DC Working Voltages of 30V, 50V, 75V, 100V, 150V, 200V, and 250V are standard. 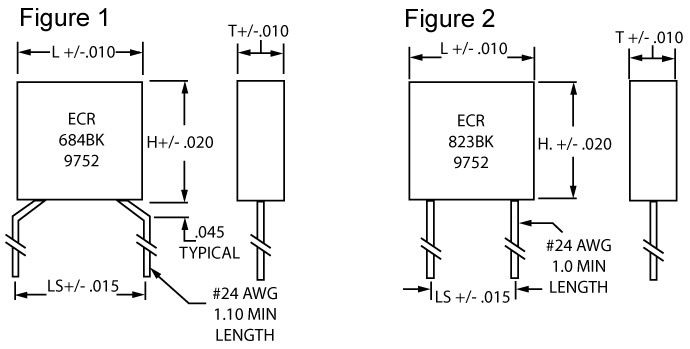 EC PART NUMBER CAP µF VDC PHYSICAL SIZE LEAD SPACING LS FIGURE NO. Capacitance shall withstand a DC potential of 200% rated voltage for two minutes without damage or breakdown. Test voltage must be applied and discharged through a resistance of 1 OHM per volt, minimum, and at 25°C. When measured at 1KHz, the dissipation factor shall not exceed 0.3% from +25Ã‚Â°C to +125Ã‚Â°C.